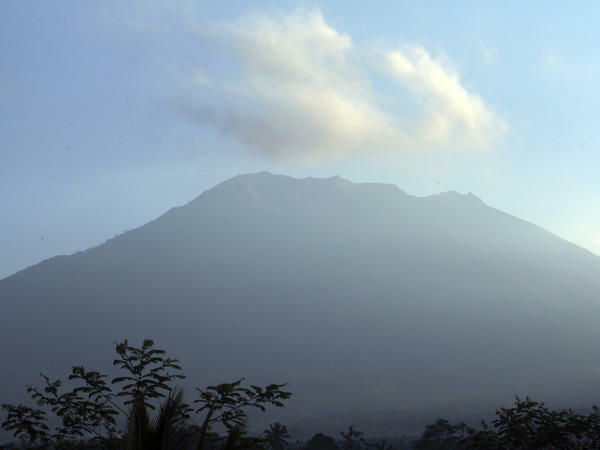 Mount Agung volcano, seen at sunrise in Bali, Indonesia, could erupt soon, say authorities. Residents, tourists and climbers are being told to stay far away from Mount Agung, a large volcano in Bali where hundreds of shallow volcanic earthquakes have been recorded in recent days. The volcano's last eruption, in 1963, killed more than 1,000 people. "The disaster mitigation agency said 48,540 people had fled and the number was expected to rise because more than 60,000 people lived in the danger zone," Agence France-Presse reports. Agung is the highest point in Bali. An eruption would likely bring deadly threats from a rain of heavy ash, as well as from pyroclastic flares (volcanic stones) and pyroclastic flows (lava). As the Smithsonian's Global Volcanism Program reminds us, "A VEI 5 eruption during 1963-64 produced pyroclastic flows and lahars that caused extensive damage and resulted in more than 1,100 deaths." The government has imposed a 12 kilometer (7.5 miles) exclusion, or "danger zone" around the volcano, according to the Associated Press. People who live in the area are being warned to prepare masks and other gear that could protect their nose, mouth and eyes. The U.S., Australia, New Zealand, Singapore and the U.K. have issued travel advisories, warning its citizens of the danger. "If an eruption occurs, there is considerable disaster potential. This can happen because today many people live in disaster prone areas. In addition, people around Mount Agung also do not have enough experience to face the eruption of Mount Agung because this volcano last erupted in 1963 (54 years ago)," said Indonesia's volcano monitoring body, MAGMA, as quoted by Australia's news.com.au.